This page lets you configure VPOP3 for sending outgoing mail. For most small businesses you will want to choose the via your ISP's SMTP relay server option. 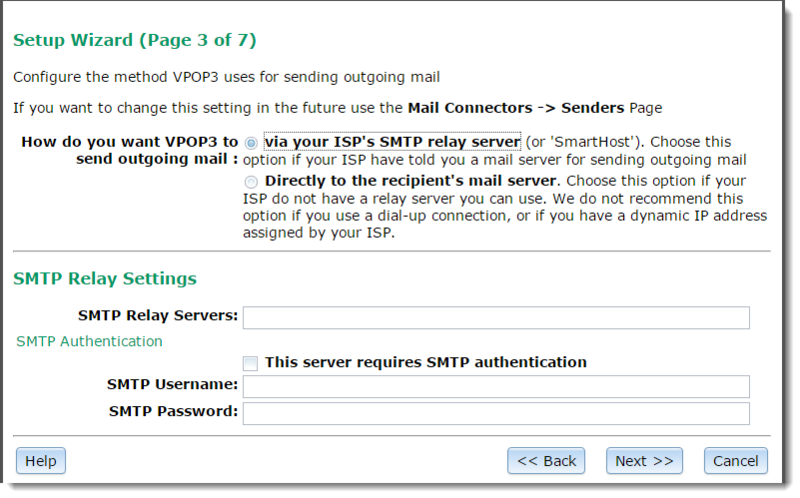 Use this option if your ISP has provided you with an SMTP relay server (or 'smarthost') to send your outgoing mail through. This is the same as how you would send mail from a normal email client such as Mozilla Thunderbird or Microsoft Outlook. Bigger companies who have leased lines or co-located servers may wish to send directly to the recipient's mail server. With this option, VPOP3 looks up MX DNS records and sends messages directly to the recipient's mail server. This is quite different from how a normal email client would work. It is more complex to get working reliably because many big mail providers set special conditions for which servers they will accept mail from (e.g. reverse DNS, IP addresses not being in certain 'dial-up lists' and so on). Also, you will see VPOP3 being unable to send messages and retrying, which can confuse some people. With the first option, this retrying is carried out invisibly by your ISP's smarthost so you can't see it; with the second option, VPOP3 is managing the retrying, so you can see it. If you use the via your ISP's SMTP relay server option, then you should enter the relay server address, and username/password, if required, in the boxes on this page. In this case, just enter the DNS servers to be used by VPOP3 (or leave blank to use the DNS servers used by Windows). VPOP3 needs a reliable DNS server to perform direct sending, as it uses DNS to discover which mail server should be used for each recipient email domain. Note - if you don't want VPOP3 to send outgoing mail at all, choose via your ISP's SMTP relay server, and leave the SMTP Relay Servers box empty.